The pickup: Last week's delivery from the Gardenripe CSA brought bok choy, snap peas, basil, a big bag of salad greens, and a flat of ripe, sweet blueberries. We also had some Kotata blackberries left over from the previous week's delivery. 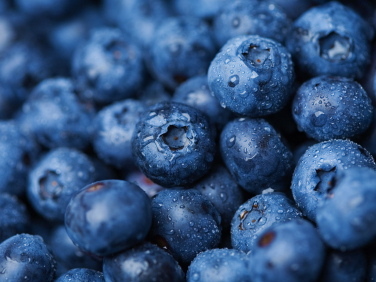 [%image blueberries width=300 float=left caption="Blueberry blast."] The results: The three of us (and our pocket pet) have had a blast just popping the blueberries into our mouths. We also produced a pie that mixed the blueberries and the blackberries. And against the advice of Oregonian food editor Martha Holmberg to just freeze berries in a bag, I threw a few pints of blueberries and Kotatas on sheet pans to freeze, 'cause I don't like to have to take an ice pick to a log of frozen berries just to make pancakes in the winter. There are still a couple of pints left; they're destined for the dehydrator, where they'll become chewy, dried bonbons for mixing with salty nuts in a homemade trail mix. Finally, the bundle of basil was delicious chopped and showered onto fresh pasta with olive oil. Although we had a fridge full of great produce, we couldn't resist going to the opening of the Montavilla Farmers' Market, where we had our first real taste of tomatoes for the season. A pint of pear-shaped red tomatoes that seemed like the essence of sunshine disappeared into our daughter's belly faster than you can say "healthy snack."